Q: What do you get when you cross a social network with an ecommerce site? A: Goskoop: a custom cyber deals site with a personal online ecommerce concierge that continually searches the Web for whatever you ask it to find – products, services, books, music movies, vehicles, real estate – even a job. Instead of you searching for what you need – what you need finds you! Enter a search once and Goskoop will keep seeking deals until you click ‘turn off’. Over 1000 beta testers have used Goskoop to date and there are already over ten million products listed on the site with more being added every day. 70% of inventory is national. Early listings are strongest in these METROS: Dallas, San Francisco, New York City, Boston, San Diego, Los Angeles, Seattle, Chicago, Houston, Atlanta, Miami, Nashville and Washington D.C. The best coverage of products so far is in electronics, movies, health and beauty, watches and jewelry, toys, baby products, and supplements. Goskoop is small business friendly! and promote yourself on their site. Realtors: add rental and sales listings and create a local network. Select what you need (books, ebooks, business/service, job, music, movie, product, real estate, vehicle. Choose between buy or sell / own. Type what you want in the search box. This screen capture shows a pending search ready to click "skoop it". When you’ve found your deal and don’t need the search any more simply delete the search. Or if you are busy and want to save it until later, you can easily turn off matches with a click of a button in your vault. When others are searching for the same thing as you are you can see them in Others Buying Same - and add them as connections to exchange resources or ask questions. Goskoop is just out of beta and additional features are scheduled to go live October 1st including the ability to sort results by price, date and relevance. services and for now that is completely free of any cost to them. You can also list and find jobs and real estate. Goskoop has just released a Goskoop Android Mobile App and has a Goskoop iPhone app in development to make it fast and easy to manage your deals from your smart phone. You can even take photos while out shopping to remind you what you are interested in that will be included in your vault result. My readers know how much I emphasize the need for independent alternatives to multi-national corporations. Big brands are controlled by the same big money as the major media and they use it to promote companies they control like Google, Facebook, Twitter, eBay. If you hear about a brand in the media or they are featured in movies, television shows or at sporting events they have the support of the major media. The challenge for small, independent solutions is they will never have that backing – all they has is US to create a grass roots movement to support them. This is a MAJOR uphill battle and Goskoop and other startups and businesses need us to consistently spread the word and use their sites. Goskoop could grow into an alternative to Google, Facebook, and all the others IF we are willing to use them and be patient as they roll out new features. I’m game – are you? i am in search of some cool deal and its great to find a very great place. Nice idea, i really like this, to be able to sell, and find what you need. Thanks. For Buyers – it saves what you need and tracks/updates sellers/deals so you save money and time! Same for the sellers: saves what they have to sell and tracks/updates buyers so they save their time that they can devote back to their core business. This is a really interesting concept is it only available in the US or does it cover ecommerce sites in the UK? It covers eCommerce Sites in the UK [for Jewelry and Watches, Home and Kitchen Products, Clothing Accessories, Health and Beauty, Outdoors and Garden, Toys, Video Games, Baby Products, Sporting Goods, Computers, Electronics]. We are working to get more deals/products inventory for UK. We have similar volume for Canada as well [especially with computers and networking]. The overall idea is great, having a new e-commerce experience. And they already have apps for android and iPhone at the ready for its big launch, it would seem that they really do want this to go big pretty fast. I’m very excited about it, it’s going to be a great way to buy and sell things on the internet. Plus the feature to see who are buying the same products as you is an awesome bonus. We should have iPhone app very soon followed by iPad app. The timing is just right with the holiday shopping season around the corner. We are committed to doing everything we can to give the user a great and a complete buying experience with deals! Creating a social networking site for E commerce purpose is a very smart idea. This not only helps people to shop online faster but also helps small businesses promote their products. Thanks to Noel and everyone who read this article. 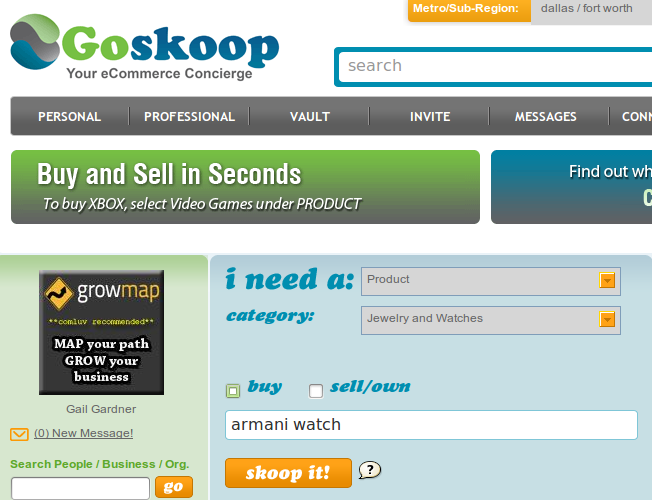 Goskoop’s mission: To create an equal market opportunity for Small Businesses to sell online. We aim to put Small Businesses back in the forefront! Perhaps you don’t see the potential it has for finding what we need easier? If there is something specific you don’t like or just didn’t see you could provide feedback. Their team is very interested in continual improvement and has some major new features rolling out in October. What a great idea. But where is Goskoop searching for the product that you need? Online retailers? All over the globe? At stores nearest your location? Oh… Cool…!! I think this is one of the best e-commerce site allowing you to find the best products and services. However, still I am not sure how to list our products and services on that site. Any idea friends ? 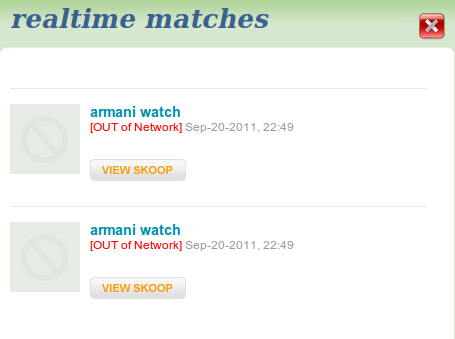 The GoSkoop website seems to be having much potential. People should make use of it. Thanks for sharing such a wonderful and useful website with us…. In the “i need” box, instead of ‘buy’ [which is default], you select ‘sell’. i must register here and use this service. great information. i am going to share this with my fellow colleagues and they will also join this. Sounds interesting, are they only accepting ecommerce sites, or can affiliate centered shopping sites enter? I really like the option of “Others Buy Same” as it helps to connect with other individuals and share resources to get the best deals. The concept of Vault is amazing as it searches for you instead of just showing similar items like in Amazon or eBay. I really appreciate and support your initiative in coming up with a new business strategy. I am currently looking to buy an Amazon Kindle 3G, I will try using this one. I think Goskoop will take a lot of time to come in parallel to Google ,Facebook and other. Over I can say that it is a new introduction. Think of your potential customers: who are they, how do they look, what do they do, what are their needs, exactly how you can help them, where you can find them. Go out, meet people (personal contact is very important and it works). Send follow-up emails. Create informative newsletter that answers your clients questions and gives solutions to their problems but is not selling. Send them links to your blog posts. Only all those means together will give you the expected result. Well, we haven’t tried this yet but I think this will bring a lot of improvements in ecommerce. Does it cost something upon registering? This is great, one of major problem of the seller specially small business like mine is how to find potential clients. Good thing this application’s a big help! We are happy to hear that! It was designed to help the sellers find the buyers and vice-versa. that’s will be a great way to sell or buy a product. will can get an automated option between the products. looking forward to sell some products there. On Goskoop, you can buy and sell simultaneously as many products as you want! Well worth registering and using. Its going to be a great product!!! !